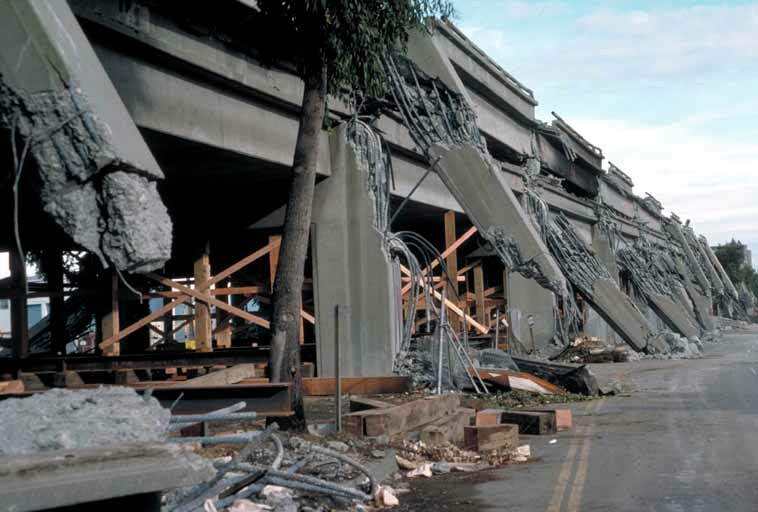 A new report from the U.S. Geological Survey says a major earthquake on the Oakland section of the Hayward fault could kill hundreds of people and injure thousands. The USGS report out today examined what could happen in the likely scenario of a 7.0 quake. 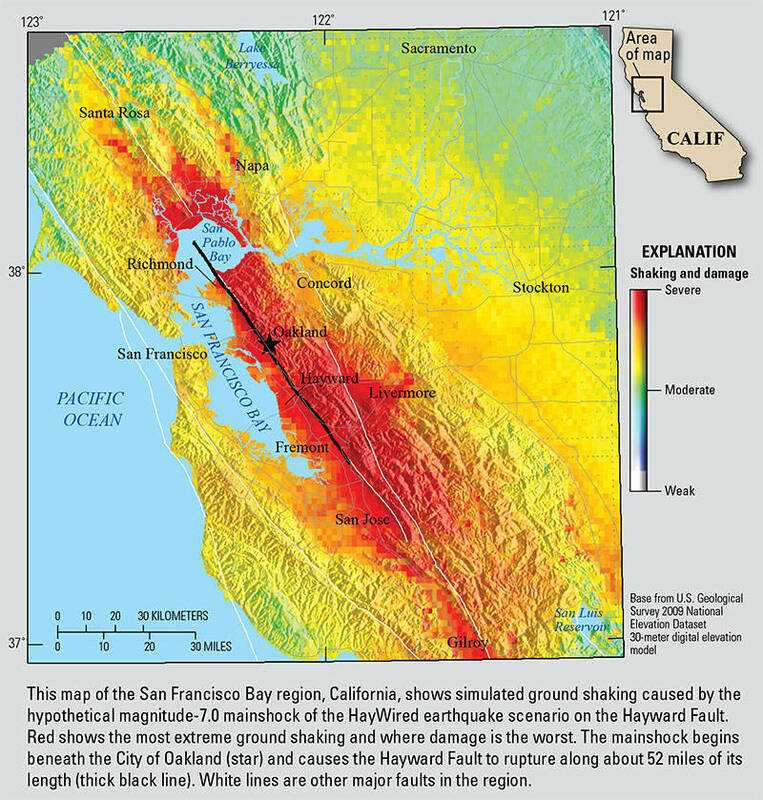 Similar large earthquakes have occurred on the Hayward fault every 100-220 years for nearly two millennia, and last happened 150 years ago. The scenario imagines an earthquake centered in Oakland, happening at 4:18 p.m. on the same day as the 1906 San Francisco earthquake: today, April 18. The quake ruptures the fault for 52 miles, from Fremont to the middle of San Pablo Bay. It causes violent shaking from Richmond to Fremont, killing 800 people from building and structural collapse and damage, and injuring 18,000 people. In the scenario, roughly 2,500 people need to be rescued from collapsed buildings, and 22,000 people are trapped in elevators. Scientists also ran the scenario imagining people using the ShakeAlert emergency early warning system and found that if people actually "Drop, Cover, and Hold On" as many as 1,500 non-fatal injuries can be prevented. The violent shaking causes soils along the San Francisco Bay to become slippery, moving like liquid, and causes landslides in the hills and mountains surrounding the bay, especially the East Bay hills. East Bay residents could lose water supplies for 6 weeks, and this disruption would also hamper firefighters, who could face some 400 fires from ruptured gas and electricity pipes all over the Bay Area. Thousands of people could be left homeless from the fires. The report recommends three top priorities to reduce the fatalities and damages from this kind of disaster: replace old and brittle water pipes, enhance building codes, and adopt and use the ShakeAlert early warning system. "People are willing to pay more for better building codes," Andrew Michael, geophysicist with the U.S.G.S. Earthquake Science Center in Menlo Park, said to KQED's Forum. "I think the important thing is for people to become informed and become engaged in the process to help inform policy."